WASHINGTON (CNS) — A group of priests, religious, young immigrants and their supporters gathered outside of the U.S. Capitol Feb. 6 to pray for the Dreamers, whose lives are in limbo, and for the legislators who have the power to change their situation. Following an opening song and Scripture readings, the group prayed the sorrowful mysteries of the rosary. Each decade began with a reflection on the suffering of Dreamers — young immigrants brought as minors by their parents into the United States without legal permission. During the third sorrowful mystery, the crowning with thorns, the crowd reflected on how Jesus’ captors did not find torturing him to be enough, but also needed to humiliate him with a crown of thorns. Similarly, stereotypes and other verbal abuses are the thorns that harm and humiliate Dreamers in the midst of this time of uncertainty, the reflection said. 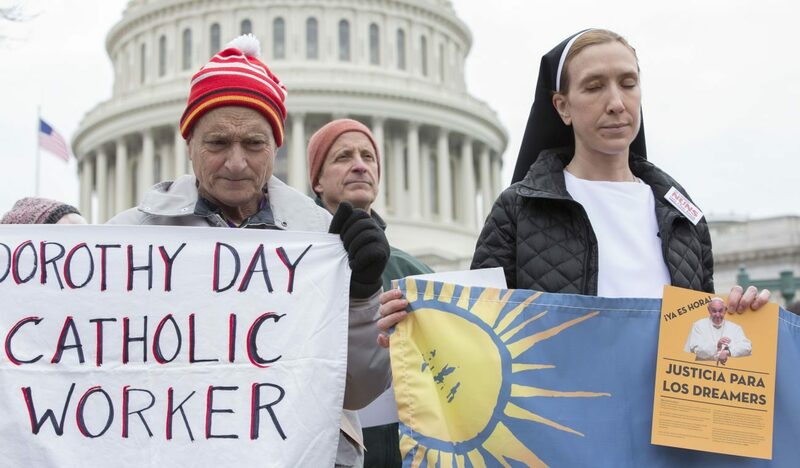 “It is beautiful to ask Mary to intercede today, not only for the Dreamers, but for their parents too,” he said, urging everyone to pray for House Speaker Paul Ryan, R-Wisconsin, who also is Catholic. Vargas said he thinks there would be enough votes to pass a DREAM Act if it got on the floor in the House. “There are good people on both sides who want to protect these young people and their families,” said Vargas. “It brings me a lot of joy to see there are so many people with us,” she said.